The standard way to build Weborama compliant ads is to use our templates as starting point for your creations. Although this is the common way, sometimes we get the question, how can I use Animate CC for my creation if it is not a template? And, does this affect the standard way of building ads? The answer is, yes, Animate CC material can be integrated in our platform. Modify the Adobe Animate CC HTML file in order to make it Weborama compliant. Move the Adobe Animate CC content into an existing Weborama template. Create holders in Weborama standard HTML templates to load Adobe Animate CC content. It depends on the type of format you are working on. If it’s for a regular in-page ad, the decision is easy: option A. If your creation will run on a more complex kind of format/set, for example a floor-ad or a home-page takeover, you would be beter off using option B or C.
There are some preparations needed in order to run on our test and live platform. Publish again and you will see all assets are duplicated next to your HTML file. Now your Adobe Animate material is ready for all conversion options. As mentioned before, if you are making a Rich Media kind of format/set, for example a floor-ad or a home-page takeover, you would be beter off using option B or C. If it’s for a regular in-page ad / banner, we recommend option A. So let’s see how the options work. This option is easy and recommended for simple in-page ads. It implies changing the "Template for Publishing HTML" in the Publish Settings. Open your Publish Settings (File > Publish Settings) and go to the second tab (Advanced). Click on Import New... and select the HTML file you just downloaded. Our meta data, indicating the type and size of the ad, is added. Our "Screenad" library is included with a script tag. This option implies not modifying the Adobe Animate CC material but moving it into one of our plain HTML templates. Copy and paste the create-js script line into the head of the template. We recommend to change the create-js library path for our (latest) copy: //media.adrcdn.com/scripts/external/createjs/createjs-2015.11.26.min.js (more available here). Call the init function from the start-up function in the template. This function may vary depending on the type of format. The most common ones are onShow and onStart. Copy and paste the canvas tag into a content holder element of the template. Use our screenad click command for the exit click. Syntax: screenad.click();. More information about this is available via our API. This command can be used directly in the Adobe Animate CC interface when building/coding your creation. This option is easy to implement but has limitations. In our plain HTML you can add an iframe tag in order to load a second HTML which is produced in Adobe Animate CC. Remember to "prepare" your ad for these changes, as set out earlier in this guide. Be careful with the properties of the iframe; use the right size and disable borders and scrollbars. 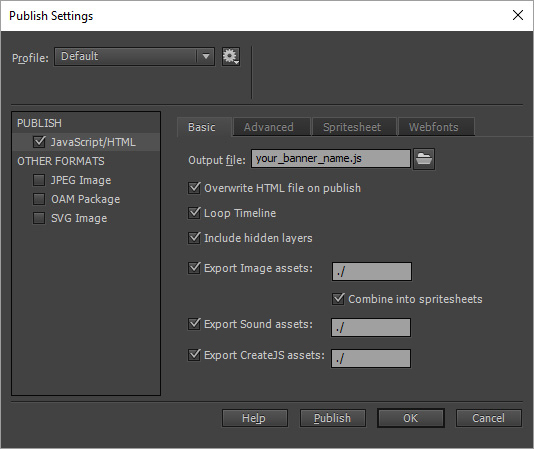 When uploading your files to the previewer, make sure the template HTML files are set as indicated in the spec sheets, and assign the Adobe Animate CC HTML files as Assets. If you have any questions or suggestions please let us know via support@weborama.nl, or submit a new request by using the menu at the top of this page.